I have a clear memory of being around 10 years old, lying on my grandma’s 1980s brown and maroon patterned carpet on one of those Saturday afternoons that could last forever, killing time by idly flicking through a travel brochure. Endless images of swimming pools and white lego concrete hotel blocks blurred into one until I reached the page for an imaginary-sounding place called Thailand, specifically an island called Phuket. Something about the pictures on the page, the exotic animals, the flowers, the sunsets, encouraged me to pull out my illustrated atlas and read everything I could find about this magical place. I decided that very afternoon that I would go this place called Phuket in Thailand and last summer, almost twenty years later, I did just that. The largest Thai island, now known as the ‘Pearl of the Andaman’, Phuket has developed over the years into one of the top tourist destinations in Thailand. If you turn away from the beach and look inwards you’ll see that most of Phuket is mountainous and the island is so huge and intensely developed in places you could be forgiven for thinking you hadn’t left the mainland. The biggest town, most popular beach and liveliest nightlife on Phuket can be found in Patong. Great for a few nights of letting down one’s hair, Patong is the original sin city of the islands having learned all of its moves from big sister Bangkok. Besides the lure of one of the best party-scenes in Thailand, Patong has a high concentration of luxurious resorts and fine-dining restaurants to keep the more demanding jet-setters satisfied. After Patong, Karon Beach is Phuket’s second largest tourist draw. Although large resort complexes including Hilton Phuket Arcadia and Movenpick Resort line the road behind the shoreline the actual beach itself is undeveloped, leaving plenty of space for sun loungers and an uninterrupted view of the sunset. Karon beach is close to a stretch of coral reef and there are year round opportunities for snorkeling and diving. Along with Patong and Karon our third beach, Kata, makes up Phuket’s holy trinity of tourist beaches. A few miles north of Patong Beach, Kata is also undeveloped with coral reefs for snorkeling and plenty of waves for surfing. Visit in the low season to enjoy the beach alongside Kata’s local Muslim population rather than fellow tourists. For a quieter beach experience away from the big three, head north of Patong to Kamala Beach. Quite isolated with good swimming between November and April, Kamala is a good spot for a sunset walk and quiet meal on the sand. Alternatively head further north to Surin Beach where the quietness is more about exclusivity than lack of development. 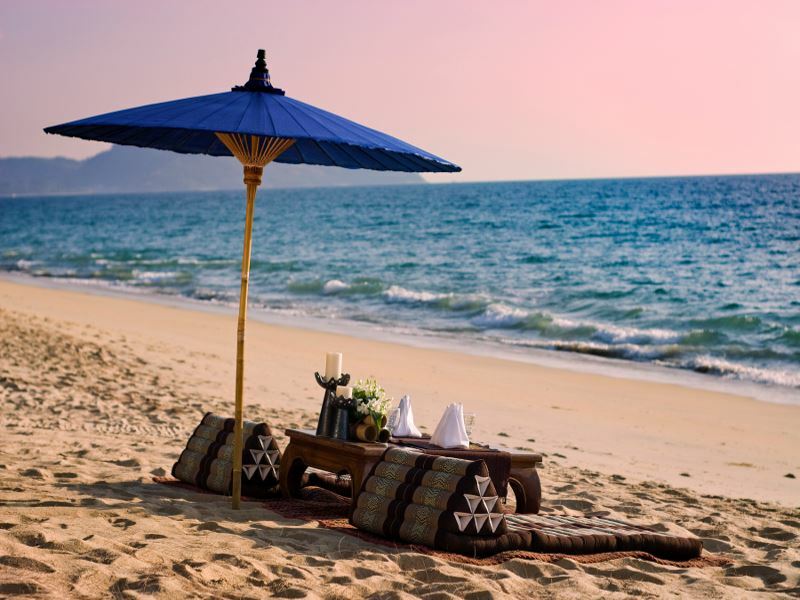 Known as Millionaires Row, Surin Beach is home to top-end luxury resorts, wine bars and restaurants said to be frequented by celebrities. If you simply want to be alone, and who can blame you, you can always stay in one of the self-contained resorts on Bangtao Beach, a four mile stretch of sand close to the village of Cheng Talay. Take a short walk away from your accommodation and you may find yourself completely alone. Freedom Beach on Phuket’s West Coast is another hidey-hole worth finding as is Banana Beach, south of Naithon Beach, and Yae Beach, a few miles north of Patong. If you’ve had your fill of beach-hopping and want to spend at least one day of your vacation without sand in your shoes head to Phuket’s Old Town. A painfully underappreciated part of Phuket’s intriguing heritage and modern-day charm, the Old Town is a former trading port and the center of the island’s cultural and religious life The Sino-Portugese architecture is a treat as are the many trendy cafes and boutique shops continuing to pop up all over town. Like any Thai district inhabited by a majority of Buddhists, Phuket has many temples and is home to the unique Big Buddha, a 45m image of Buddha covered in white Burmese marble that sits on the peak of a mountain and can be seen from many parts of the island. The way Phuket has developed to cater to increasing numbers of tourists has been felt by the island’s wildlife in recent years. The Khao Phra Thaeo Wildlife Park works hard to promote the welfare of Phuket’s wildlife and runs a conservation project for a number of wild species that would have gone extinct in Phuket without their intervention. A visit to the wildlife park will help the project continue its good work and if, like Thailand’s diverse monkey population, the jungle is your natural habitat you can even spend the night in a tree house.